Congrats to the New York Times for its scoop on the "new Democratic strategy" of lashing out at Charles and David Koch, libertarian philanthropists who, according to the Times, "look genial enough." What makes this year’s effort to villainize the Koch brothers a "new" strategy for Democrats is unclear, but this is the New York Times we’re talking about, so they must be on to something, especially considering their piece is a pretty transparent ripoff of this Buzzfeed article by Kate Nocera from less than a week ago. Perhaps there is some nuanced distinction that sets Harry Reid's latest bout of hysteria apart from the 2010 campaign, when Democrats ran furiously against the Koch brothers and got shellacked on Election Day, losing independents by 15 points. On the other hand, perhaps not. Maybe it’s the clever new slogan: "The G.O.P. is addicted to Koch." It’s clever because "Koch" is pronounced "coke," as in the drug "cocaine," which is addicting. That’s pretty funny. Credit to Reid’s wife Landra Gould, who apparently came up with it. And maybe that slogan will prove effective in Alaska, where Democrats are reportedly going to recycle the anti-Koch strategy in support of vulnerable incumbent Mark Begich. It may be harder to pull off in Arkansas, though, where Senator Mark Pryor (D) is struggling despite accepting thousands of dollars in un-American Koch money. According to the Times, Democrats are convinced that Koch-bashing is a "politically shrewd" endeavor, and is grounded in "Democratic-funded research." The Times editorial board has been beating this drum for weeks, denouncing the Koch brothers and their "right-wing political zeppelin," and all but pleading with their readers to donate to cash-poor Democrats. Reid was especially moved by a recent presentation at the Senate Democratic retreat emphasizing the need to "pick a villain." The majority leader’s lunatic outbursts on the Senate floor are intended to raise the Kochs' public profile and, more importantly, to rally the Democratic base, specifically the pro-cancer wing. Reid’s motivations are pure, however. He’s just looking out for middle class Americans, who the Koch brothers are trying to "squeeze out of existence" because the Kochs are "against everything that’s good for America today," such as marijuana prohibition, ethanol subsidies, war, cancer, and efforts to prevent gay people from getting married. Indeed, nothing says "standing up for the middle class" like liberal billionaire Tom Steyer putting up $100 million to promote urgent action on "climate change," an issue only 27 percent of Americans consider to be an "absolute priority." Reid has no reservations about attending fundraisers with Steyer, because as far as he’s concerned, money in politics is only a problem when it’s being spent against Democratic Senators who might lose. 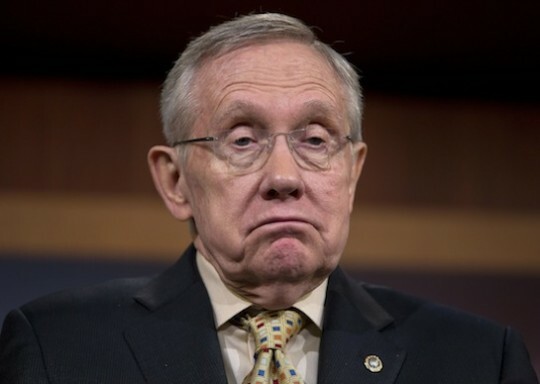 Or as Reid puts it: [Tom Steyer] is not trying to buy America, he’s concerned about climate change." Reid, per the Times, seems to think his repeated denigration of two rich guys might be a "Sisyphean task." He’s already lost the Morning Joe crew, which isn’t a good sign. Meanwhile You Decide 2014 draws closer. Keep rollin’, Harry. This entry was posted in Politics and tagged 2014 Election, Harry Reid, Koch Brothers, New York Times. Bookmark the permalink.